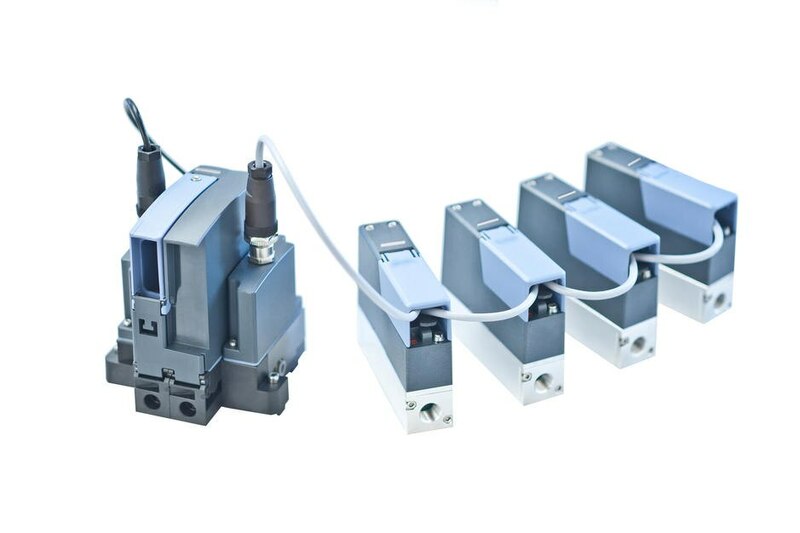 The new device platform EDIP (Efficient Device Integration Platform) from Bürkert offers a efficient way to integrate several sensor-actuator modules, such as the new Mass Flow Controllers or Meters of the 874X series, into an Industrial Ethernet network using a superordinate system control unit. The new product series is part of the 'Inspiring Answers' campaign presented by Bürkert at the 2014 Hanover trade fair as a demonstration of pioneering innovations in fluid technology. Bürkert has eliminated control-related elements for the new Type 8741 Mass Flow Controller (MFC) / Mass Flow Meter (MFM). These control tasks are assumed by a superordinate control unit which addresses sensor-actuator modules (SAM), such as Mass Flow Controllers, by means of a system bus. The SAMs are equipped with an interface for the proprietary Bürkert System Bus (büS). Previously, each MFC/MFM included its own control hardware; now the Type ME2X system control unit (SCU) is used. The SCU can control up to 16 control circuits (e.g. SAMs) at once and functions as a gateway between Industrial Ethernet and the büS. As a result, the field device level can be connected directly to Industrial Ethernet in a effective manner. büS is based on CANopen, however it works with auto-addressing and without a master in the system. If a CAN bus is already present in the customer application, switching between büS and CANopen is possible with a DIP switch on the device. The shift of the control hardware from the MFC/MFM to the SCU results in considerable benefits in applications with numerous control loops. Both the simplified flow controllers/meters and reduction to only one Ethernet interface in the central control unit contributes to easy implementation and high efficiency of the plant. Type 8741 is equipped with MEMS technology for direct flow rate measurement in gases and designed for flow rates from 0.01 Nl/min to 80 Nl/min (referring to nitrogen). The MFCs/MFMs convince with high accuracy, quick response times and excellent repeatability. In the process, it achieves very short settling times. All Type 8741 devices are enclosed in a sturdy polycarbonate housing which is seated on the fluid aluminium or stainless steel body. The 4-pin terminal block ensures easy electrical connection. The Type ME2X system control unit (SCU) has a modular design. The gateway module ME23 is mounted together with the büS input and büS output modules ME29 on a joint backplane, which permits top hat rail mounting. Type ME24 I/O modules can be optionally integrated in the SCU. Two RJ45 plug connectors establish the Ethernet connection and a mini-USB port is provided for factory service. The parameterisation and diagnosis of the components takes place with the Bürkert Communicator software and the büS stick which is available as an accessory. As part of the new EDIP device platform, this enables convenient process control. A highlight is the User-f(x) function which can be started from the Bürkert Communicator. The User-f(x) enables fast and simple programming of customised system controls. Signals read by the SCU (e.g. from an ME24 I/O module) can also be processed. A well-known example for use of such a controller is the adjustment of gas mixtures. Bürkert’s Mass Flow Controllers (MFC) for gases are used in industrial processes, such as the production of metal or glass components, where gases which are usually inert, reactive or flammable must be dosed with a high level of accuracy and repeatability. An overall system comprised of an SCU and the new compact MFCs is a convincing package with efficient Ethernet connection, and simple, but powerful integrated software.